Out of the four Summerhouses that we make for the National Trust, this is the Flatford. The Flatford has got a pent roof, which has been covered with a corrugated material, a roof overhang at the front to help protect the front of the building from harsh weather, and there is an opening window on either side. To create a traditional style, we have used features like vertical sawn cladding boards, Fleur-de-Leys cast iron door and window furniture and leaded windows in the design. This traditional style holds a bit appeal for our customers, especially those with more rustic, country gardens. There are six different paint colours to choose from with the National Trust range, and this customer chose Disraeli Green, a pale green colour that really suits their garden. This is the smallest size Flatford we make (1.8 x 2.4m), but other sizes are available: National Trust Summerhouses. 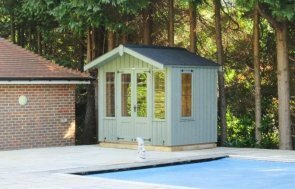 Or if you would like something a bit different to this, you can browse our other garden buildings here. If you would like to discuss a query with one of our team, please contact us, request a callback or call us 01760 444229 to speak to our expert advisers if you have any further questions about our buildings.